Once it's activated, the new tool shows up at the top of your News Feed as a share option along with status updates, links, photos, and video. There is also an option in the left navigation column so you can see your friends' activity along with results from questions you have asked and answered. 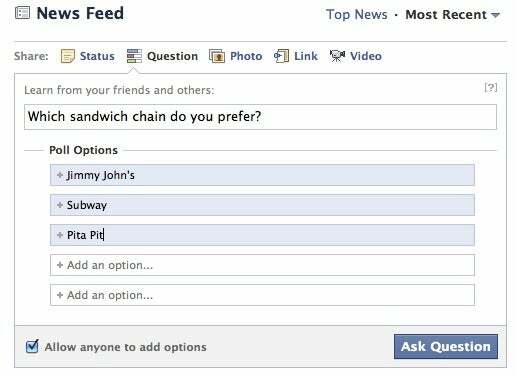 Let's say you wanted to ask your friends "Which sandwich chain do you prefer?" 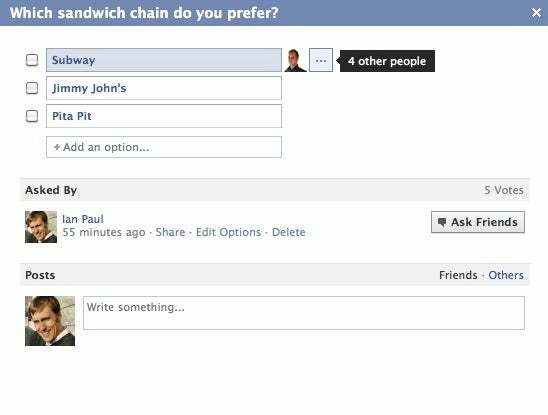 Just type in the question and then you have the option to set specific answers such as Jimmy John's, Subway, Pita Pit, and so on. You can also decide whether you want to let people add more possible answers or restrict them to a specific set of responses. To see how much of your profile is visible to people who are not your friends, Click on "Account" in the upper right corner and select "Privacy Settings." On the next page, click on "View Settings" underneath the heading "Connecting on Facebook." At the top of the next page, you should see a button that says "Preview My Profile." This will let you see how your profile looks to people on Facebook who aren't your friends. By default, the response window will also show you how your friends answered the question. But you can also see how everyone else on Facebook answered the question by clicking on the "Others" link at the bottom of the window. To see responses to poll questions, click on the small window with three dots next to each answer. This will show you the answers of people who aren't your Facebook friends. You do not have to answer a question to follow it. You can also ask specific friends a question created by you or by others by clicking on the "Ask Friends" link underneath each question. 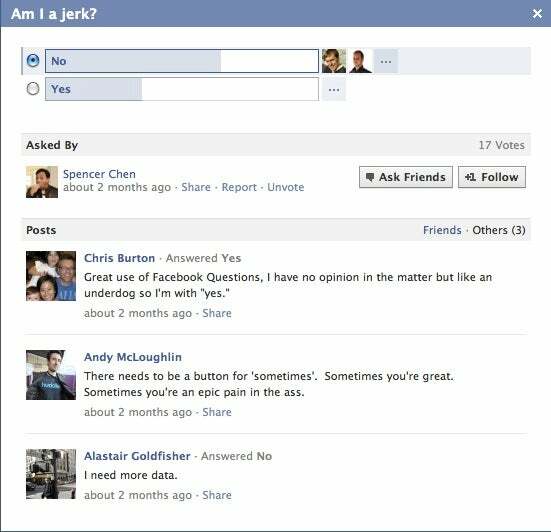 To get the most out of Facebook Questions, it's best to be specific in your questions and not ask something generic such as "Am I A Jerk?" As you can see in the included image, generic questions can get passed around very quickly among people who don't even know you. Then again, asking random things of the whole world could end up being half the fun of Facebook Questions. If you can't get enough of asking and answering questions you should also check out a popular service among early adopters called Quora.